Anne Brontë (17 January 1820 – 28 May 1849) was a British novelist and poet, the youngest member of the Brontë literary family. The daughter of a poor Irish clergyman in the Church of England, Anne Brontë lived most of her life with her family at the parish of Haworth on the Yorkshire moors. For a couple of years she went to a boarding school. At the age of nineteen, she left Haworth working as a governess between 1839 and 1845. After leaving her teaching position, she fulfilled her literary ambitions. She wrote a volume of poetry with her sisters (Poems by Currer, Ellis, and Acton Bell, 1846) and in short succession she wrote two novels. Agnes Grey, based upon her experiences as a governess, was published in 1847. Her second and last novel, The Tenant of Wildfell Hall appeared in 1848. Anne's life was cut short with her death of pulmonary tuberculosis when she was 29 years old. 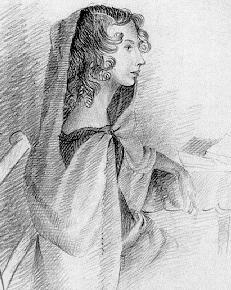 Anne Brontë is somewhat overshadowed by her more famous sisters, Charlotte, author of four novels including Jane Eyre; and Emily, author of Wuthering Heights. Anne's two novels, written in a sharp and ironic style, are completely different from the romanticism followed by her sisters. She wrote in a realistic, rather than a romantic style. Her novels, like those of her sisters, have become classics of English literature.